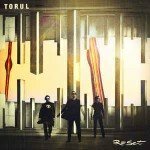 Genre/Influences: Industrial-body-music, industrial new-beat, EBM. Background/Info: Vasi Vallis became a praised and recognition musicians as a member of Frozen Plasma and NamNamBulu. He started Reaper in 2005 as a kind of ‘industrial’ answer to his electro-pop music. The debut album “Hell Starts With An H” became an instant sonic hit, but the past few years we didn’t hear any new work by Reaper. But last year Reaper struck back with a new EP entitled “Der Schnitter” and here’s finally the long-awaited new album. Content: Vasi Vallis seems to have exorcised his most hidden and evil sonic fantasies. 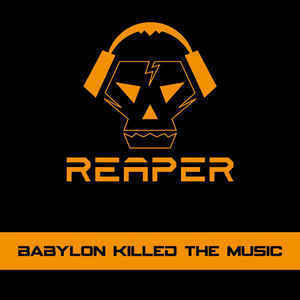 “Babylon Killed The Music” is a varied composition moving from dark-electronics into industrial-techno to next experiment with pure trance leads. And the crazy sonic ride is only at the beginning. Reaper also deals with dance and acid influences while even getting back to new-beat elements. The work sometimes sounds pretty dance-like, but later on totally minimal and hard EBM to finally reach a rather relaxing and evasive style. + + + : Reaper merges an impressive arsenal of influences with each other. Whatever the ingredients are, Vasi Vallis has the skills to transpose it into heavy dark dance vibes. The sound treatments remain one of his greatest talents. Every single song is accomplished with a true passion to create blasting sound vibes. But I don’t know of many underground artists who on the same work can mix new-beat and pure dance/trance influences together with harder industrial elements. Reaper sounds like the offspring between Scooter, Front 242 and Adam X. This album features many potential hits. – – – : There maybe are one or two songs, which don’t totally work, but globally speaking this album has no real major minus points. I however can imagine that some narrow-minded underground lovers will find this work too versatile and mainly experimenting with music styles they can’t link with ‘dark’ music. Conclusion: You can really feel Reaper is simply fun project for Vasi Vallis, but the results sound like a supreme new opus, which will be without a shadow of a doubt become one of the best albums of the year. This artist is a sound wizard belonging to a real restricted number of artists like Jan Loamfield and Seb Komor. Best songs: “We Are Reaper”, “Sechzehn Punkte Plan”, “Neophyte”, “Farewell”, “The Sound Of IDS”, “Sledgehammer”.